Bosco needs a quiet home with no other animals. Sadly Bosco came to us when he was 4 yrs old and had no socialization. Bosco is very unhappy in a foster situation with so many dogs who make him highly anxious. He is not into other animals but would love a special person to call his own. He is crate trained and appears housebroken if on a schedule. He loves to go for walks and enjoys chasing balls or sticks or anything! Bosco would prefer a home with someone around to give him the attention he has missed. I think someone dedicated to obedience training would give Bosco confidence and help develop a bond as well. Bosco is about 5 years old and weighs about 30#! 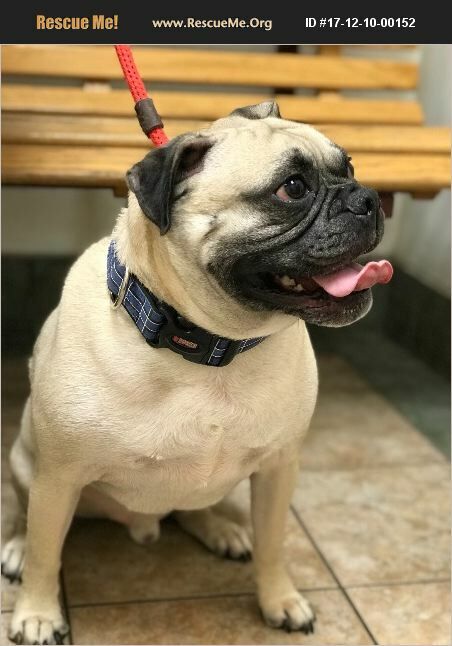 He looks like a big over sized pug... but don't be fooled, he is nothing like a pug! Bosco is overall a fairly easy keeper but it will take him some time to become your best friend! I do believe people have failed him... and although it took some time, he trusts me and has become much more personable. I believe Bosco would do well in a calm household with older children or an adult home where he is the only dog!